By channeling the intensity of x-rays, synchrotron light sources can reveal the atomic structures of countless materials. Researchers from around the world come to the National Synchrotron Light Source II (NSLS-II)–a U.S. Department of Energy (DOE) Office of Science User Facility at DOE's Brookhaven National Laboratory–to study everything from proteins to fuel cells. NSLS-II's ultra-bright x-rays and suite of state-of-the-art characterization tools make the facility one of the most advanced synchrotron light sources in the world. Now, NSLS-II has enhanced those capabilities even further. Scientists at NSLS-II's Hard X-ray Nanoprobe (HXN) beamline, an experimental station designed to offer world-leading resolution for x-ray imaging, have demonstrated the beamline's ability to observe materials down to 10 nanometers–about one ten-thousandth the diameter of a human hair. This exceptionally high spatial resolution will enable scientists to "see" single molecules. Moreover, HXN can now combine its high spatial resolution with multimodal scanning–the ability to simultaneously capture multiple images of different material properties. The achievement is described in the Mar. 19 issue of Nano Futures. "It took many years of hard work and collaboration to develop an x-ray microscopy beamline with such high spatial resolution," said Hanfei Yan, the lead author of the paper and a scientist at HXN. "In order to realize this ambitious goal, we needed to address many technical challenges, such as reducing environmental vibrations, developing effective characterization methods, and perfecting the optics." A key component for the success of this project was developing a special focusing optic called a multilayer Laue lens (MLL)–a one-dimensional artificial crystal that is engineered to bend x-rays toward a single point. 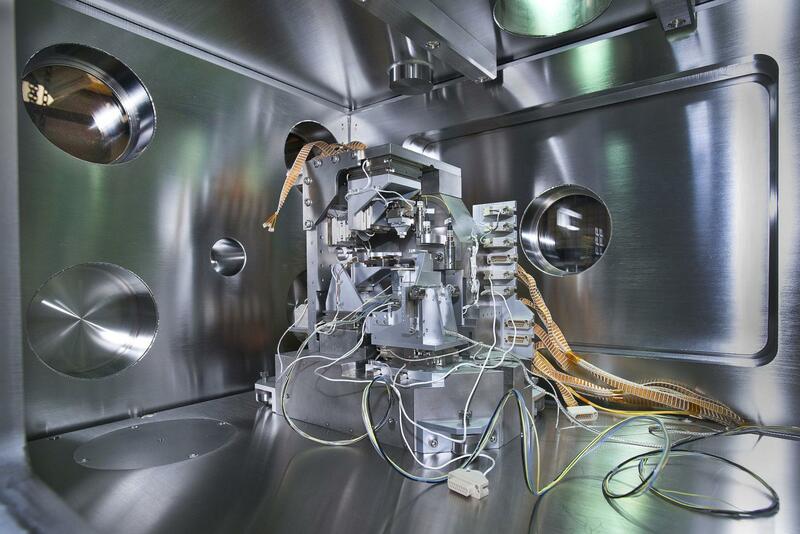 "Precisely developing the MLL optics to satisfy the requirements for real scientific applications took nearly 10 years," said Nathalie Bouet, who leads the lab at NSLS-II where the MLLs were fabricated. "Now, we are proud to deliver these lenses for user science." Combining multimodal and high resolution imaging is unique, and makes NSLS-II the first facility to offer this capability in the hard x-ray energy range to visiting scientists. The achievement will present a broad range of applications. In their recent paper, scientists at NSLS-II worked with the University of Connecticut and Clemson University to study a ceramic-based membrane for energy conversion application. Using the new capabilities at HXN, the group was able to image an emerging material phase that dictates the membrane's performance. "We are also collaborating with researchers from industry to academia to investigate strain in nanoelectronics, local defects in self-assembled 3D superlattices, and the chemical composition variations of nanocatalysts," Yan said. "The achievement opens up exciting opportunities in many areas of science." As the new capabilities are put to use, there is an ongoing effort at HXN to continue improving the beamline's spatial resolution and adding new capabilities. "Our ultimate goal is to achieve single digit resolution in 3D for imaging the elemental, chemical, and structural makeup of materials in real-time," Yan said.